Pastalaya is a relatively new dish appearing at social gatherings. It’s a very close cousin of jambalaya because you use the same ingredients, but substitute some type of pasta for the rice. If you struggle with the rice in your jambalaya being too crunchy or mushy, give pastalaya a try. The pasta is much more forgiving when it comes to the water ratio than rice. Most cooks use spaghetti, but any kind of pasta will do. Thicker types of pasta may need more water. This recipe is the one I used to place second in a local cook-off this past Spring. I multiplied all the ingredients by five and used my five gallon pot since the rules required the recipe to feed 50. I am not crazy about competition cooking, but it was part of a professional conference and my office hoped to “make a statement” to our colleagues from other offices. This was my first time to make a pastalaya in my large pot and only my second time to use this recipe, so I was pleased with the results. Next time, I think I will use bow tie pasta because I beleave it will make a better presentation. 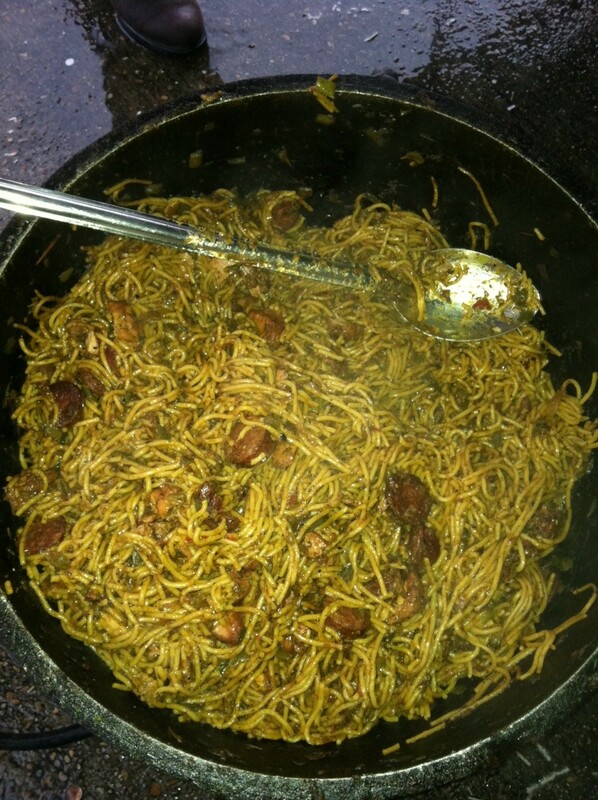 Pastalaya – This batch was made in my five gallon black iron pot and placed 2nd in a local cookoff. 1 pound of pork sausage (sliced) mild. NOTE 1: I heat my water and add beef broth granules, or bullion cubes to save money. This should serve 12 to 15. Heat oil in pot – just enough to brown and keep sausage from sticking – brown and remove sausage. Cook bacon – when crisp remove bacon, wrap in sliced bread and eat. You can skip this and sub veg oil if you prefer a good heart to good flavor. In bacon grease – add onion and cook until it starts to caramelize. I have learned you really need to get onion caramelized to bring out its best flavor. Adding peppers or other veggies in this stage will prevent onions from caramelizing due to too much steam from water. Add ground sausage and brown. Add the broth, meat from steps 1 and 2, and bring to a boil. Salt and pepper the chicken and add to the pot. Stir till chicken almost done. Taste and add creole season, salt and pepper to taste. Should be a little salty because spaghetti will take some salt. Now add the spaghetti. Don’t forget to break it. You can reduce heat to medium after adding the spaghetti. Now, stir the spaghetti well. NOTE 2: This is an important step because you do not want the spaghetti to clump together. Once you are satisfied that each strand is loose, turn off the burner,stir in the parsley and green onions and place a lid on the pot. Allow your pastalaya to stand for about 20 minutes. NOTE 3: It is okay to stir the pasta every 5 to 10 minutes to prevent the pasta on top from drying out or sticking to pot.